So I made it to Wudang! I went off to a 20 hours train ride to Wudang. 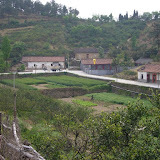 Here are the first snapshots of the Wudang Mountains. I will write a bit more about my experience here when I get some time. Nice photos. Are you still around the Wudang Area? I'll be there soon.